Teething baby? Need a baby gift, or got a baby shower? Shop Australia's finest selection of custom baby name teething toys; including teething ring, wooden baby toy, silicone teether, available with custom colour selections. Personalise your baby teether toys to include a name, date of birth, or special message. Choose from our FREE LASER ENGRAVING on wood teethers or silicone letter beads. NEW | Australian Nature Inspired Flora Plant + Fauna designs proudly made, drawn + designed in ..
NEW | Etched or Custom Engraved - WILDBUBZ® Natural raw beech wood timber rattle teether toy, si..
New | Modern Silicone LUNA MOON | Love You To The Moon + Back | Teether Toy - EXCLUS..
•new• CAMERA Teether On-trend, modern and practical our exclusive WILD BUBZ® teethe..
•new• DIAMOND WILD BUBZ® Teether On-trend, modern and practical our exclusive ..
•new• WILD BUBZ® Teether - Exclusive to Teething Baby Australia On-trend, mode..
WILDBUBZ® Texture | Natural Beech wooden Teether toy with an exclusive designed combination of&n..
Lord of the rings fan? This is the perfect Teether for your baby! 100% non-toxic | Independentl..
Silicone pastels & Beech wood ring teethers! These gorgeous teethers are made from ..
Beech wood Teether toy with gender neutral pastel food-grade silicone beads. Your choice of Beech..
Ombre coloured silicone beads interlock with a beech wooden teething toy of your choice, pinks, blue..
Beech wood Teether toy with Blush food-grade silicone beads. Your choice of Beech wood teether to..
Silicone bright rainbow & Beech wood ring teethers! 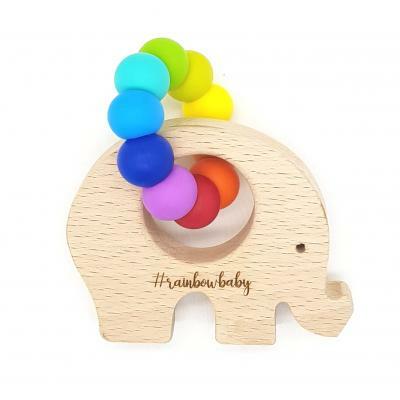 FREE BABY NAME CUSTOM ENGRAVING OPTION&nb..
Beech wood Teether toy or ring with Bright Rainbow food-grade silicone beads. FREE Baby Name..
Beech wood Teether toy with monochrome food-grade silicone beads. Your choice of Beech wood teether..
OMBRE | Silicone beads + European Beech Wood Teether Baby Sensory Toy Handcrafted + Custom Pe..
WILDBUBZ® Natural beech wood rattle teether toy, silky smooth with the sweetest woody sound ratt..
TWO TONE | Silicone beads + European Beech Wood Teether Ring Handcrafted + Custom Personalise.. BASICS | ALL ROUNDER | Silicone round beaded teether toy with interlocked beech wooden timber teethi..
DUO | DOUBLE beaded Silicone + Beech Wood Personalised Pastel Neutral Palette Teethers Beech w..
​NEW + EXCLUSIVE - Our new MODERN WOODLAND BEAR + Granite Silicone Nature Collection by WI..
WILDBUBZ® Beech wood Teether toy with neutral Rainbow food-grade silicone beads. Your choice ..
​NEW + EXCLUSIVE - Our new Granite Nature Collection by WILD BUBZ® Personalised Granite Ba.. CUSTOM ENGRAVING AVAILABLE Beech hardwood Teething Ring teether toy. Measuring approxima..
65mm Wide x 15mm Thick. 100% Non-Toxic - Natural - Raw - Unfinished Pure Beech wood Teether..
Beech hardwood Baby Wearing Logo teether toy. Measuring approximately: 95mm x 65mm [ Teething ..
Beech hardwood Donut teether toy. Measuring approximately: 95mm x 65mm [ Teething Baby?? .. Measuring approximately 95mm x 65mm. Love Bird Dove wooden teether toy. [ TE..
Beech hardwood Camera teether toy. Measuring approximately: 95mm x 65mm [ Teething Baby?? ]&nb..
Beech hardwood Elephant teether toy. Measuring approximately: 95mm x 65mm [ Teething Baby?? ]&..
Beech hardwood Swiss Cross teether toy. Measuring approximately: 95mm x 65mm [ Teething Baby??.. Beech hardwood Wild teether toy. Measuring approximately: 95mm x 65mm [ Teething Baby?? ] ..
Beech hardwood Woodland Bear teether toy. Measuring approximately: 95mm x 65mm [ Teething Baby..
Food grade silicone faceted Geo chew teething bangles! + Exclusive custom colours availiabl..
+ Food grade silicone teether toy cookie! Safe for teething babies or kids with sensory needs + +..
Food grade silicone Elephant teether toy. ***10 EXCLUSIVE COLOURS! ** NON-TOXIC: ..